[Sam Seide] dropped us a line about his new arcade creation. 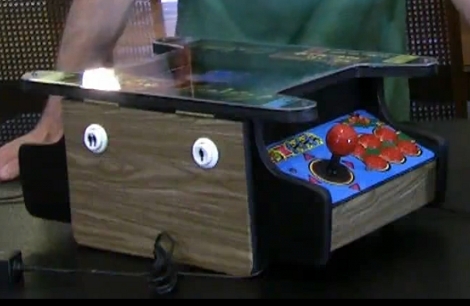 We loved his Punch-Out build that used a punch dummy as a game controller. This time around he’s made some mini-cocktail style MAME cabinets. He removed the screen from a netbook and placed it face-up underneath the acrylic bezel. There are controls on either side for two players as we would expect from any quality cocktail cabinet. The control panels are interfaced through the now familiar iPac boards and are a bit unfinished on the underside but that doesn’t decrease our need to see one of these on the coffee table at home. Check out demo and an outline of the parts inside after the break. I’ve always thought the cocktail cabinets were already child sized, I hated them. These are more like back seat of the car sized. Slap some batteries in them, market them portable. Problem is that not many of the kids today are going to like the 80’s games with the Xboxs and PS3s. Even the portables now are much more complicated game wise. It is a very clean looking build though. I want to chime in here a bit; my 8yo daughter prefers arcade games because they’re easy to pick up, easy to learn, and easy to put down. No commitment. No tutorial. No frills. There’s something to be said for arcade games in the modern day. Beating the high score is a simple thing that everyone understands, and often times meeting or beating the high score requires an understanding of the game’s scoring nuances in addition to quick reflexes and mild strategy, all of which are rewarding when finally met with success. I think I just came! @Hirudinea You should seek a medical professional immediately if you cant tell when you ejaculate. Despite the nice “casing”, I wouldn’t call this a “hack” I mean, he could have at least set up a custom OS and an external power button. @greycode I really don’t get out and about much anymore to know if anything like the original cocktail cabinets are in use or not. As in the tables that first appeared in bars with the game pong. They where definitely adult size. Kids still play old board games if they are available, no doubt they will play the old video games too. Very nice build man, I mean perfect. Good detail and function, best of all IT WORKS. Love the style, job well done. Hope you get your money worth on the auction you deserve it. And it is like a hack, as “A Hack”: Is something used in a way it was not intended. So yeah it would be classified as a hack. As using the laptop in that was, as it was not intended would make it an hack. Blond guy is annoying. Why is he in the video? The blond guy is my good friend, Zack Scott and it’s his youtube channel that the video is on. I don’t use my channel on youtube really and Zack has nearly 100k subscribers who seem to like seeing my builds. I’d love to see plans for this. I’m a builder myself and my bro in law is getting very serious into this stuff. Any chance you’d post some? Jesus Christ, I envy you people for having such great skill at painting, assembling, circuiting etc. This is unbelievable, really, I can’t stop watching the videos. You do impress me, but I lack the skill :( Keep up doing beautiful things. Sam, how did you produce the decals? I printed the decals up here at my work. We have a laminator here that can put laminate on one side and adhesive on the other. The great thing about this build is that each of the decals are 11×17 or smaller so they could technically be printed at kinkos cheaply if you were to make your own. The wood grain vinyl is just Contact paper that you would use to line drawers of cabinets with. I picked some up at home depot. I just laid a thin layer of epoxy down on the wood then smoothed the contact paper over it. Worked much better than expected. Any chance we could get build plans, or more information? I also noticed that the non-cocktail games split the screen and nicely duplicated the screen for the top and bottom player – is that a feature of the front-end or of MAME? All in all – very impressed with it and even without more information I am thankful for the information shared in the videos (just sayin’ – more technical details would be great)….. I second the call for build plans.. I’ve always wanted to build a mini cocktail cabinet to house my MAME setup, and this is really sweet ..
Mame has the ability to rotate and set the video output to cocktail mode built into it. Just go into the video options screen once mame is running. These are really cool! I love them!